Article from Thompson Reuters Foundation by Antonella Notari Vischer. 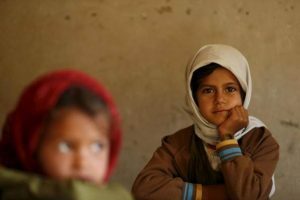 Girls attend a class at their school in a village outside Yemen’s capital Sanaa February 2, 2016. REUTERS/Khaled Abdullah. A girl’s emancipation starts with being able – and permitted – to envision a strong, meaningful role for herself in society. If she can confidently base her professional, social and personal plans on her aspirations and aptitudes – rather than be dictated by stereotypes and limited by prejudice – she can begin to realise her full potential as a liberated and empowered human being. We all know how enriching this will be for her and for those around her. Let’s ask ourselves how we can encourage young women to soar with confidence and purpose, acquire the knowledge and skills they need to succeed and lead others in confronting the complex challenges of our world. Recently, when Hasbro omitted the female hero Rey in their “Star Wars” version of the Monopoly game, they were rattled to their roots by the viral campaign set off by 8-year old Annie Rose, who protested: “How could you leave out Rey? Without her, there is no Force Awakens! Besides that, boys and girls need to see women can be as strong as men. Boy or girl, who cares? We are all equal, all of us!” (see #WheresRey on social media). Hasbro had to issue a new edition of the game, this time including the much revered Rey. Which goes to show that girls – and boys! – will wholeheartedly acknowledge a credible female leader and will be inspired by her, disproving some established marketing rules that action figures and leaders must be masculine to gain acclaim and sell. At the Womanity Foundation, we have successfully experimented with the use of fiction to break down barriers around women’s restricted roles in society. In 2014, we began producing an Arabic fiction series featuring a young female journalist, Noha, who courageously and creatively tackles the challenges that typically obstruct an Arab woman’s professional career and personal self-realisation. The first season of the series was aired in 10 countries across the Middle-East and North Africa reaching millions. It engaged over 150,000 followers on social media in critical conversations and was used by civil society organisations and cultural centres to animate debates around women’s rights and their place in society. A young woman leader from Yemen recently wrote to say how much her organisation had benefitted from this simple tool, which allowed them to question the legal, social and cultural impediments imposed on women in their society. Hence, one effective way to promote strong, aspirational models of women for girls and boys is by encouraging the presence of female lead figures in the media, be they fictional or real. We can do this by being a demanding audience who request diversity and protest against biases. Indeed, media productions are influential means to propagate female voices and create a space for them to exist in the public sphere. We have learned this with the establishment of Radio Nisaa, the first commercial women’s radio and website in the Middle East, co-created by Womanity and the Nisaa Broadcasting Corporation, led by the brilliant social entrepreneur Ms. Maysoun Odeh Gangat. Not only does Nisaa feature women more broadly throughout their cultural, political, economic and social program offer, it also offers an array of career opportunities to women in media, as well as on-the-job training and internships. In short, Nisaa allows women to set the editorial agenda, design, research and present the stories. Moreover, it provides a platform for women to express themselves as leaders in business, government, the arts, sports and society in general; and last not least, it engages its audience in conversations that affirm women’s rights and demonstrate that women can equally and successfully assume important public roles, thus inspiring more women to follow suit. Radio Nisaa has risen to rank among the top radio stations in Palestine in just 6 years. Remarkably, Radio Nisaa’s listenership is half male and half female. Rather than aligning with senseless rules and stereotypes, they are identifying with a progressive view of gender parity, shared civic responsibilities and a common humanity. Through the work at Radio Nisaa, and through other programs with which we have been associated, we have understood that another powerful way to boost a girl’s confidence and broaden her perspectives is by devoting time to her, coaching her, providing her with inspirational and practical mentorship, connecting her with relevant networks and giving her personal and professional opportunities. A girl with an ambitious plan, especially one that disturbs the set order, will meet with criticism, contempt and hostility, if not outright aggression. Doors will slam close into her face and she will be questioned and held back, sometimes by her own family and closest peers. She will need sound, candid advice from those who believe in her potential, concrete help, as well as inspiration and guidance to overcome her loneliness and doubts. This kind of support can be and already is provided at scale by organisations who invest in girls’ education, women’s vocational training, the respect for women’s human rights and their possibility to participate fully in society. Moreover, we who have already gained some life experience can all take on at least one girl or young woman as a protégée and help her believe that she can become who she aspires to be. And then watch as she strides on her own path with the determination and assurance of a forceful hero.